Please read the prompts for each chapter and add your thoughts and comments below. Please keep your entries professional and respectful. Use the reply option if you have a question or comment on someone else's post. We can make this an interactive space - an ongoing conversation - and get the most out of our learning together. Starting January 4, each Friday, we will post two prompts for that week’s chapter. You may choose to respond to either or both prompts. It's okay to go back to previous weeks if you fall behind. The posting schedule and running history of prompts is here. Make a goal for yourself and share it briefly here. It might be a plan for changing your teaching practice in a small or large way, a personal commitment to finishing the book, or any other objective you’d like to accomplish based on your participation in this book study. What was your favorite routine or strategy you learned from the book and/or the Fostering Math Practices website? The book explores many ideas about teaching. What idea was most thought-provoking for you? You can answer directly, OR use the sentence frame below. I used to think ___________________ and now I think ___________________. We hope you can join us this week for an interactive Q & A on Routines for Reasoning with author Grace Kelemanik. If you have a question you'd like to ask, plan to join us on 3/13 and ask live, OR post it here, OR email it in. See the Book Study Main Page for a video recording of the interactive Q & A Session. The authors stress the importance of “doing the math” yourself, reflecting on the mathematical thinking embedded in a problem. Choose a problem and routine and “do the math” and tell us about the experience. 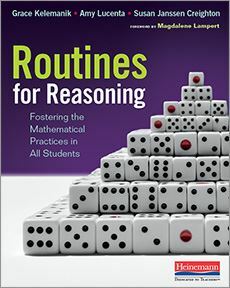 We’ve worked through the 4 routines in the book (and you may have explored 2 more at www.fosteringmathpractices.com). Which one do you feel most capable of trying? Which one seems to connect well with your goals for math content or student thinking habits? (Note, we asked about thinking habits in Ch 2 here https://atomicmath.org/Winter2019_Prompts_Responses/699659 ). This chapter is chock-full of suggestions and strategies for implementing the routines in your teaching. Comment on a piece of the advice that resonated with you. Share a problem scenario from your teaching that you think would be appropriate for the Three Reads routine. Please remind us of your grade level/subject. If you want to share a task with the group, send a document, photo, or link to atomicbookclub@gmail.com and I will set up a shared google drive folder for the materials. Have you encountered this in your own teaching? Share your thoughts. As you read through the extended vignette for the Three Reads routine, what do you notice or find thought-provoking?